VFL RD19: Recap Watch Marcus Wagner and Peter Marcato provide a recap of Collingwood's 16-point win over Geelong at Victoria Park. 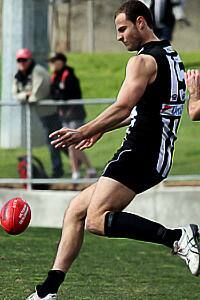 Jarrod Witts played well in the ruck and kicked two goals as the VFL Magpies defeated Port Melbourne at Victoria Park. Photo: Shane Barrie. Finals-like intensity came three weeks early for the VFL Magpies in a tightly-contested clash with Port Melbourne at Victoria Park on Saturday. In Collingwood’s last home game of the season, the visitors did everything possible to ensure they could once again come out of top. After four quarters of intense and at times emotional football, the Magpies emerged on top. Travis Cloke kicked five goals and Brent Macaffer was named the best player on the ground in a 16-point victory. “We knew they would challenge,” ruckman Jarrod Witts told Collingwood Media post-game. “They’ve got some big bodies that play pretty physically. Serving as the VFL Magpies’ 11th-straight victory, this match acted as the most challenging clash in a number of weeks. Despite surrendering four of the first five goals in the game, Port Melbourne controlled the second quarter and took a one-point lead into half time. It could have been more if not for momentum-shifting majors late in the quarter to Witts and VFL-listed forward Jordan Collopy. With September looming, the ability to respond from adversity proved one of the more redeeming features for development coach Tarkyn Lockyer. “We relished the challenge and I thought we showed a lot of maturity today,” Lockyer told Collingwood Media post-game. “Going into the last part of the season and then the finals, we know we’re not going to get the game on our terms every time. Jordan Collopy celebrates one of his two goals against Port Melbourne. Photo: Shane Barrie. Tensions between the two sides boiled over at the half-time siren as a number of players engaged in a scuffle in the middle of the ground. The feeling was evident once again in the third quarter, and a free kick and ensuing 50-metre penalty got Port Melbourne on the board early in the term. It was then Travis Cloke’s turn to take over. After threatening amidst heavy pressure early, the powerful forward broke the shackles and took a towering contested mark at the Yarra Falls end. He kicked two goals in a row before Ben Moloney extended the VFL Magpies lead to 17 points midway through the third term. Four of Travis Cloke's five goals came in the second half as the forward led the VFL Magpies to victory. Photo: Shane Barrie. Yet a Borough fightback was inevitable and it was only fitting to see it established by a man so comfortable in his Victoria Park surroundings. Former Magpie Sam Dwyer kicked his second goal of the day, and one that may have even drawn a cheer from the Black and White contingent of a large Victoria Park crowd. “He’s a quality player and it’s good to see him back in the team,” Witts reflected post-game. Try as Dwyer and his new Port Melbourne teammates may, Collingwood kicked clear in the final term to secure a 16-point victory. A second goal to Collopy and a fifth to Cloke came in a quarter that threatened to favour Port Melbourne’s Yarra Falls end of the ground. “At three-quarter time the game was in the balance and we were probably kicking to the non-scoring end for the day,” Lockyer said. Two road trips await for Collingwood as the Magpies continue their remarkable run to the VFL finals. The Pies will play Box Hill at Box Hill City Oval next Saturday before concluding the home and away season against Footscray.